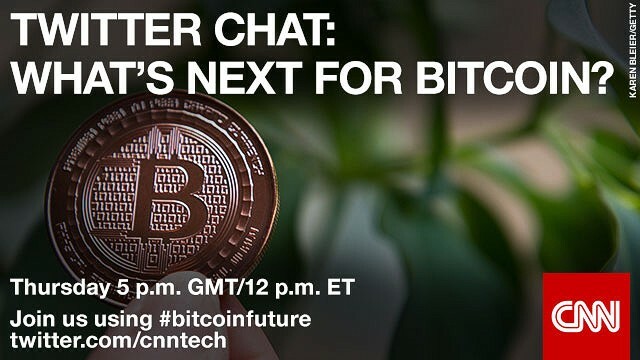 (CNN) -- Today, Thursday December 18, we're hosting a Twitter live chat @CNNTech debating the future of Bitcoin with a panel of experts. Join us at 5pm GMT/12pm ET by tuning into the hashtag #bitcoinfuture. We look forward to seeing you there! Jeffrey is the author of "Bitcon: The Naked Truth about Bitcoin," and has been described as the world's 'leading financial crime author' by the British Bankers' Association. As editor of CoinSpeaker, Daniel reports on the latest developments in the world of cryptocurrencies. He is a regular public speaker, and writes regularly on the issues and innovations affecting companies and markets around the world. Harvard Georgetown Law Center's Professor Levitin specializes in bankruptcy, commercial law, and financial regulation. His research focuses on consumer and housing finance, payments, and debt restructuring, and he currently serves on the Consumer Financial Protection Bureau's Consumer Advisory Board. Founder of the inaugural Scottish Bitcoin Conference Dug Campbell gave a TEDx talk in early 2014 entitled "Bitcoin: More Than Just Money." He also runs the Scottish Bitcoin Meetup. Tony works as a lawyer, specializing in financial services and banking. He has held senior legal positions at a range of major companies including Barclays Wealth, where he was Co-head of Legal. Ben is a researcher on internet and society at Harvard, and a Bitcoin expert.